The A Girl Named series tells the stories of how ordinary American girls grew up to be extraordinary American women. Misty Copeland became the first African American Female Principal Dancer for the American Ballet Theatre, but how did she get there? A Girl Named Misty describes the defining moments that made up her childhood and adolescence with full-color illustrations throughout. 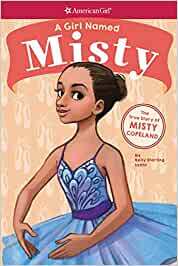 In addition to stories and facts about Misty's upbringing and accomplishments, the book includes a timeline and a glossary, plus a profile of a noteworthy and contemporary American girl following in Misty's graceful footsteps to lead the way for African American women in the arts. Start reading A Girl Named Misty on your Kindle in under a minute. 3.0 out of 5 stars!! My little granddaughter is a budding ballerina and this book is just very encouraging and she was thrilled. Bought this for my daughter who is obsessed (not in a crazy stalker way) with Ms. Copeland. My daughter liked this book a lot. She is a ballerina. The story and illustrations are very nice. sounds almost like Gabby the gold medalists story word for word just ballet instead of gymnastics.